As the days get colder your heating system becomes ever more active. Make sure your pumps are working in the most efficient possible way to keep your home or building filled with warmth all season long. Any number of issues can occur, and if they do, our professional heating pump service in Brooklyn can assist. At NY Pump, we are committed to providing you with high quality heating pump service at affordable prices. With half a century's worth of experience, we are well-versed in many different varieties of heating pumps, giving them longer life and trusted performance during winter. Below, we’re going to discuss a few indicators that you might need heating pump service in Brooklyn. Pumps are prone to natural wear and tear over time. This could lead to all sorts of cracks and leaks. This could be dangerous for any number of reasons. There is no such thing as a good leak. If you notice your pumps leaking or cracking in any way please contact us for heating pump service in Brooklyn. It’s essential that the pump components are serviced and repaired as soon as possible. Cracks and leaks that go ignored can lead to more serious issues in the future. Bringing with them all sorts of inconveniences and hefty expenses. So having our professionals work on your heating pumps before any serious damages occur will ensure reliable usage. Noise is a big indicator that there’s a problem with your heating pumps. If you notice any odd noises or increased noise coming from your heating system this can be a big indicator of an issue. Older, more worn heating pumps are prone to making all sorts of annoying noises. Contact us if you notice your heating pumps have gotten particularly noisy. It could be time to get heating pump service in Brooklyn. Taking preventative measures is always ideal for maintaining any home system including your heating pumps. Sometimes damages occur and things need to be repaired. We’ll be happy to service your heating pump system and all its components. We want your home or building to be thoroughly heated through the colder months. It’s our priority to make sure your heating pump system is working properly. Keeping your warm through these seasons is important and we take it upon ourselves to make sure it stays that way. By keeping your pump system running efficiently. For more information about our affordable heating pump service in Brooklyn, call NY Pump at (718) 768-8700. Boiler feed pumps are a very important part of the boiler system. It’s absolutely integral to have the pump components working in their optimal condition. If this part of the system begins to weaken or fall apart it could cause lots of issues. So it’s in your best interest to make sure your pumps are in the working condition with boiler feed pump repair in Brooklyn. Also, performing regular maintenance will prevent serious damages in the future. At NY Pump, we’re able to repair pumps in systems large and small. Our expert team has over 50 years of dedicated service in the industry and have the methods, equipment, and knowledge to get your boiler feed pump working without delay. When you bring your boiler feed pump to us for servicing, you can expect professional attention and efficient work. We stand by our boiler feed pump repairs and are dedicated to your satisfaction. Once we are completed, your boiler feed pump will perform for years to come. If you notice your pipes acting erratically or seeming obviously in trouble please contact us for expert boiler feed pump repair in Brooklyn so we can help. Possible issues with the valves. These components can wear out over time and with regular usage. Checking for performance issues in your boiler feed pump can save time and money later. Doing this ensures that your feed pumps stay in proper working condition. Having them checked and repaired before a problem worsens can save you from many headaches in the future. Not only will boiler feed pump repair in Brooklyn prevent trouble but also save you a money if boiler feed pump replacement is required in the future. We repair and rebuild boiler feed pumps into working condition. Allowing your boiler system to run as efficiently as ever, and preventing issues for quite some time. Of course, not everything can be prevented and systems can break down for any number of reasons. When your pump is damaged, our professional boiler feed pump repair in Brooklyn works without delay to give you the performance you're looking for. As stated earlier, any number of issues can cause feed pump problems. Allowing their components to become damaged can impede on the heating process. Although it’s difficult to prevent everything, it will save you in the long run to have your boiler feed pump checked and potentially repaired as the problems arise. Keep this in mind, and ask yourself when the last time you had your pumps checked and repaired. For more information about boiler feed pump repair in Brooklyn, call NY Pump at (718) 768-8700. Pumps are an integral part of many components found around your home and/or building. Sometimes pumps can be damaged or worn out over time. So it’s best to make sure your pumps are in optimal condition to be used by the components they’re attached. NY Pump delivers high quality service when your pump malfunctions are stops functioning all together. Our professional pump repair in Brooklyn will bring your pump back to life and restore usage for years to come. With over half a century's worth of experience, you'd be hard-pressed to find a company that understands pumps, pump parts, and pump repair like we do. We've seen all types of pumps in our day, and our expert technicians are trained and experienced to enhance the lifespan of your existing pump and restore its performance., NY Pump works hard to get your pump up-and-running with pump repair in Brooklyn, making sure your pump works hard for you. Allowing systems around your home or building to function well, as they’re supposed to. It’s important to have your pumps checked and repaired every so often. This is to avoid any problems that could occur in the future. By maintaining and repairing pumps, you’re preventing failure or disruption of systems in the future. Having your pumps repaired can also save you a fortune in replacing components in the future. Not only does having your pump repaired and maintained save you money, but it also lengthens the life of equipment involved. Now of course some things just cannot be prevented, and that’s okay. We’re professionals; we’ll repair your pumps to efficient working conditions. It’s our duty to have them back and ready to go as soon as possible for your application without delay. If you notice any of these it’s best to give us a call as soon as possible. We’ll be able to get in there and discover the root of your problem and work to resolve it. If you have any reason to believe you’re having pump issues or would like get them inspected, stop by NY Pump for expert service and care. We’re long-time professionals and we know how these pumps function and how to repair them with long lasting results. For more information about affordable pump repair in Brooklyn, call NY Pump today at (718) 768-8700. Vacuum control devices are broken down into two types. The first is known as a vacuum breaker. The second is a vacuum regulator. Each has their own use and method of operation. In the event that this delicate system requires vacuum controls replacement in Brooklyn, we’ll be ready to help after a simple phone call. For over 50 years, NY Pump has been providing exceptional pump services to residential and commercial customers in Brooklyn NY. We are committed to your satisfaction and provide prompt and expert vacuum controls replacement in Brooklyn. For the benefit of your curiosity, we’ve provided information on the two types of vacuum control devices and how they work. The first type, vacuum breakers or vacuum relief valves, will control vacuum by providing ambient air into the system. These breakers will control the pressure within the system at the outlet port. They will open to create the highest amount of useable absolute process power or to reduce the level of vacuum in the system. If the absolute process power is too low, meaning the vacuum power is too high, the system will use a plunger to allow outside air to enter. Then everything balances itself out. If this balance is off, you need professional vacuum controls replacement in Brooklyn. The second type of vacuum control devices are vacuum regulators. Air is throttled in the system in an effort to get the right amount of process vacuum. In contrast to the vacuum breakers, pressure in the regulators is caused by the inlet port, not the outlet. This regular increases the absolute pressure within the system by closing to reduce the vacuum level. The plunger within the system will lower if the process pressure is too low in order to restrict the gas flow. This gas flow is then pushed forward to increase the pump’s process. As you can see, creating the right amount of vacuum within a system is a difficult thing to do. All of the parts within the system must be working at their best or larger failure can occur. This is why we are there to help you in the event that any of the parts require vacuum controls replacement in Brooklyn. For more information about our professional vacuum controls replacement in Brooklyn, call NY Pump today at (718) 768-8700. Your vacuum pump can take damage in a number of ways. Like any other delicate piece of machinery, small parts within the inner-working of the pump can fail, break, or wear out. Over times, your vacuum pump may begin to lag or not work with efficiency. You may find leaks and other signs of damage. In the event that any serious issues arise in your vacuum pump, we will be happy to come save the day with professional vacuum pump repair in NYC. The experts at NY Pump have been servicing residential and commercial buildings including hospitals, management companies, and municipalities for over half a decade. Our professional vacuum pump repair in NYC leaves your pump in working order, functioning as it should. Still, we would like to see you get the most of your machines. That is why we assembled information below about common ways you vacuum pump can fail and need repair. Leaks can be devastating to the pump. It needs to be air tight, so if anything it getting through, the vacuum action will be broken or slowed down. Still, other issues might arise within the pump that cause leakage. If you find any leakage, this is usually a problem with the vacuum action itself and requires vacuum pump repair in NYC. Contamination can also occur within the vacuum pump. This happens when debris gets caught up somewhere within the system. If any foreign substances enter the oil, a serious problem can arise. This is why it is highly critical for experts to come check out your pump and perform regular flushing. Gasses may also begin to spill forth from the pump. Again, this can happen when unusual elements enter the pump, oil, or other part of the system. In the event that you notice any seeping gas, you should call us right away for expert vacuum pump repair in NYC. Don’t attempt to fix the problem yourself. Dealing with these pumps is highly dangerous for anybody without the proper training and equipment. To play around with these machines without the knowledge of how they work can only cause more damage to the pump and potential damage to your body. We can get the job done right because we understand how important your productivity is. For more information about our vacuum pump repair in NYC, call NY Pump today at (718) 768-8700. Sewage ejector pump problems are often serious issues that require expert sewage ejector pump repair in Queens. The professionals at NY Pump are equipped with knowledge, training, and over a half century's experience repairing pumps and motors for residential and commercial properties. There are ways you can maintain the quality of your sewage pump system and not have to worry about major devastation. In order to help you, we’ve assembled a list of tips to get the most out of your plumbing system overall. But in the event of danger, we are still only a phone call away. If you plan on leaving the home for an extending period, you must shut off the water pump or close the main valve before you go. This is a crucial, yet commonly overlooked component of proper sewage and plumbing maintenance. The entire system may fall apart if a leak goes undetected for more than a few days, requiring professional sewage ejector pump repair in Queens. Please keep this in mind. If you are overly worried about failure to your sewage ejector pump, you can install an alarm in the system. This alarm will create a loud buzzing sound if your pump is near the point of critical failure. This will give you all the time you need to get the experts into your home for prompt sewage ejector pump repair in Queens before you find backup sewage all over your basement. If you have any outdoor faucets, you need to be sure they are able to withstand the varying climates of the different seasons. The winter is especially hard on these outdoor faucets. If they are not able to withstand cold temperatures, then you can always shut them down for the winter and open them again when the weather warms up. If these faucets freeze or become damaged, your entire plumbing system can become a ticking time bomb. Don’t play with disaster when this is such an easy preventative fix. Your plumbing system is delicate. Sewage ejector pumps are prone to fail. Don’t let the failure cause major loss to your home or property. Call for affordable sewage ejector pump repair in Queens. For more information about sewage ejector pump repair in Queens, contact NY Pump today at (718) 768-8700. The return condensate pump is also known as the boiler-feed pump. Its main job is to ensure the boiler or similar heating system runs by causing an exit for the condensate that builds up within. These pumps can take damage in many ways, which is why we exist to assist you in case something goes awry. At NY Pump we have over half a century's experience repairing pumps for residential and commercial properties. We are committed to your satisfaction and providing you with service that leaves your pump functioning the way it should. We’ve listed a few reasons why you may need professional return condensate pumps repair in NYC. Within each condensate pump there is a small basket strainer that collects sediment within the system. If this sediment gets to the receiver within, it can destroy the system. And if the strainer gets jammed up, you will begin to notice problems. Collecting this sediment is critical to prevent another, more serious pump failure from occurring down the line. If wet air gets into the system, particles within can cause the pipes, receiver, and pump to rust out. When the strainer is not collecting these particles, the entire system may begin to corrode and require expert return condensate pumps repair in NYC. It is also possible that the condensate gets way too hot for the system to maintain. You’ll notice this problem from more than the immense heat. You’ll hear a rustling sound within the pump, which means that cavitation is taking place in the system. This sound is caused when water flashes through and immediately turns into vapor. Bubbles in the vapor are another factor that can cause the entire system to corrode. Speaking of heat, if you notice that your boiler room is unusually hot, then you have another problem on your hands. But you don’t need us to tell you that. This unbearable heat around the boiler is caused when there’s not enough combustion taking place near the burners. Instead of trying to fix this problem, which can be dangerous, call for professional return condensate pump repair in NYC. Our experts provide prompt and affordable return condensate pumps repair in NYC. We are sure to get your pump working when you need. For more information about our professional return condensate pumps repair in NYC, call NY Pump today at (718) 768-8700. A heat pump is one thing you might not notice until it stops working. You may not even realize such a part exists until it’s time for heating pump motor services in NYC. Don’t worry, we know all about heat pumps and how to bring the most out of their performance. No matter the condition of your current heat pump, we can get in there and bring it back to working speed. At NY Pump, we combine our over 60 years of experience, exceptional pump services, and professional service to bring you exceptional pump motor services in NYC when you need. Because this topic may not be familiar to many, we’ve compiled a breakdown of the heat pump system in your home to give you a better idea of what our team may service on site. The first component of a heat pump is the compressor. The compressor is used to, as its name indicates, compress a low pressure gas and produce high pressure on the other end. This part is typically found on the outside of the heat pump system. The condenser is also known as the condensing unit. This coil is inside the heat pump and acts as a middle man between the high temperature, high pressure gas inside the pump. Aside from the coil, the condenser is also comprised of a fan which is meant to cool this gas down. Heating pump motor services in NYC may be needed on either part of the condenser. You may also need heating pump motor services in NYC on the metering device. A metering device is a thin piece of tubing that is meant to dispense the liquid refrigerant into the coil, where it will evaporate into usable gas. This evaporator coil shares its look with the radiator found in your car. It facilitates the evaporation of the liquid into gas. Another part of the heat pump system is the blower unit that blows air onto the evaporator coil. Remaining components of your heat pump system include a duct system which distributes the air flow and a reversing valve that reverses the cooling system to provide heat. Your heat pump system is comprised of many parts. All of which may breakdown from wear and tear or some type of internal issue. If you are experiencing problems with any of the components discussed above, then our heating pump motor services in NYC are only a phone call away. For more information about heating pump motor services in NYC, call NY Pump today at (718) 768-8700. No matter what you have your pump, what purpose it serves, and how current or outdated your pump is, our pump services in NYC offer something you need. At NY Pump, we specialize in pump installation, pump replacement, and pump repairs. Our professional contractors have been providing our services to the tri-state area since 1941. Our dedication to providing high quality service and customer service has kept us a leading name in pump services in NYC. While there’s no explicit service list, due to the difference in the pumps we service, what you’ll find below is a basic overview of our specialties. Pump repair is the most common service we offer. You may be thinking that your pump is too old to be serviced. That is not true. Our team handles all sorts of pump repairs, for both current and discontinued models. pump restoration restores how it worked when you first installed it. No more slow or unreliable pump performance means a more optimized working area. You may also need to replace the parts in your pump. That is not a problem for our expert staff, as we can inspect your pump for any faulty or broken parts and install a replacement at affordable prices. We promise prompt and quality installation with our pump services in NYC, for parts both current and classic. Over the course of our history, we have encountered many different types of pumps used in industrial settings. This gives us the on-site training and experience needed to ensure that your pump will be good as new. We see so many pumps, some of our staff have reported dreaming about themselves repairing pumps. This means one thing, we are passionate about performing pump services in NYC. We’ll bring this passion and qualification to your work site. We’ll get your pumps working the way they were intended. Replacing your pumps can be costly and time consuming. A repair will cut down the cost and save you on time. Which means your business will continue operating at full speed. For more information about our pump services in NYC, contact NY Pump today at (718) 768-8700. To ensure your guests have a comfortable stay, keeping your hotel's facilities running correctly is of utmost importance. The pumps that regulate the water systems throughout your building need stay in good shape to ensure no system breaks down. If you are in need of hotel pump repair in NYC, the technicians at NY Pump & Motor Repair are here to assist you. Let NY Pump & Motor Repair get your malfunctioning hotel pumps back up and running again in no time. If you are in need of hotel pump repair in NYC, please call us today at (646) 389-7867. HVAC pumps are necessary for properly regulating condenser water, chilled water, heating water and other water needed to keep your HVAC equipment operating properly. When these pumps break down, it can cause serious system failures. If you are in need of HVAC pump services in NYC, look no further than the pump service technicians at NY Pump & Motor Repair. 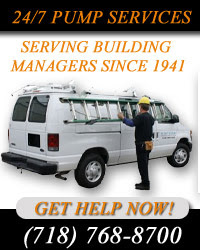 NY Pump & Motor Repair is a family owned and operated HVAC pump service in NYC, providing pump repair, replacement and maintenance services to building managers since 1941. We take pride in providing efficient and reliable services to our commercial, industrial and municipal clients all year round. We understand that pump malfunction never happens when it's convenient. We offer 24/7 emergency HVAC pump services in NYC to ensure your system stays up and running when you need it most. If you are in need of HVAC pump services in NYC, call NY Pump & Motor Repair at (646) 389-7867 today. Cooling towers are essential in keeping your industrial, municipal or commercial building cool and comfortable. Integral to a cooling tower's capacity to operate is its pump. Without a properly running pump, the tower's water would not accurately be circulated, causing a number of problems, including overheating and possible breakdown. If your building is in need of cooling tower pump services in NYC, let the technicians at NY Pump & Motor Repair help you. The experts at NY Pump & Motor Repair are equipped to handle a wide variety of cooling tower pumps from a number of popular manufacturers. We pride ourselves on providing efficient and accurate cooling tower pump service. From the initial diagnostics to the repair itself, we ensure that your cooling tower pump will be fixed quickly and accurately, keeping your cooling tower running efficiently even under heavy load. Don't let a faulty cooling tower pump lead to cooling system failures. NY Pump & Motor Repair offers 24/7 emergency service when you need it most. If you need cooling tower pump services in NYC and would like more information, please call NY Pump & Motor Repair today at (646) 389-7867. We look forward to helping you. Sump pumps are an essential component to keeping the basement of your property from retaining too much water. When your sump pump is malfunctioning, the buildup of water and other liquids in your basement can become overbearing, and in some cases can ruin a building's foundation. Keeping your sump pump running is paramount to any property. When you are in need of sump pump services in NYC, the experts at NY Pump & Motor Repair are here to help you. We service a wide variety of sump pumps from a number of common pump manufacturers. Whether you own a commercial, municipal or industrial building, our friendly and knowledgeable technicians can provide you with timely and efficient sump pump services. We understand that a sump pump problem doesn't happen when it's convenient. That's why we offer 24/7 emergency sump pump services to ensure that your building doesn't go long without it. Count on us to ensure your sump pump stays running throughout the year. If you would like more information on our sump pump services in NYC, please call NYC Pump & Motor Repair today at (646) 389-7867. NY Pump & Motor Repair is a family-owned pump repair company providing our services to the tri-state area since 1941. With the knowledge and expertise to perform efficient pump services, our professionals have gained us a reputation you can trust. At NY Pump & Motor Repair, we aim to provide customer satisfaction with our complete pump services for heating, water booster and sewage ejection pumps. With our headquarters located in Brooklyn, our pump company can provide fast services to Manhattan, Queens, Staten Island, the Bronx, Long Island and the rest of the tri-state area. Whether you need a pump repair, pump maintenance or pump installation, no job is too big for us to handle. As one of the leading Service Centers for Home Depot, Lowes and WW Grainger, we have the tools necessary for the exact pump service you need. For more than half a century, NY Pump & Motor Repair has been servicing all types of buildings including real estate management companies, commercial bakeries, woodwork shops, hospitals and municipalities. We have provided pump repair services to the NYC Housing Department, Parks Department, Department of Education, Archdiocese of NY and countless other private property firms. For more information on our pump repair company in NY, call NY Pump & Motor Repair at (646) 389-7867. Ask about our free pump repair estimate today! Are you looking for a pump service center in NYC? Look no further. Celebrating over half a century of success, NY Pump and Motor Repair is a pump service center in NYC you can trust. Located in Brooklyn, we can provide prompt pump repair service in NYC and the surrounding areas including Queens, Staten Island, the Bronx, Long Island, and the rest of the tri-state area. Here at NY Pump and Motor Repair we are committed to providing customer satisfaction with efficient and reliable pump repair service. We are a pump repair company that has the competence to take care of your pump repair needs from start to finish. There are many types of pumps such as heat pump, well pump, water pump and many more, that's why at NY Pump and Motor Repair we provide complete line of pump services with the experience to handle many different type of pumps. Since 1941, NY Pump and Motor Repair has been a great choice of pump repair service for many companies. For a pump service center in NYC call NY Pump & Motor Repair at (646) 389-7867!